Our new B40 dry fixing system offers ease and speed of installation. 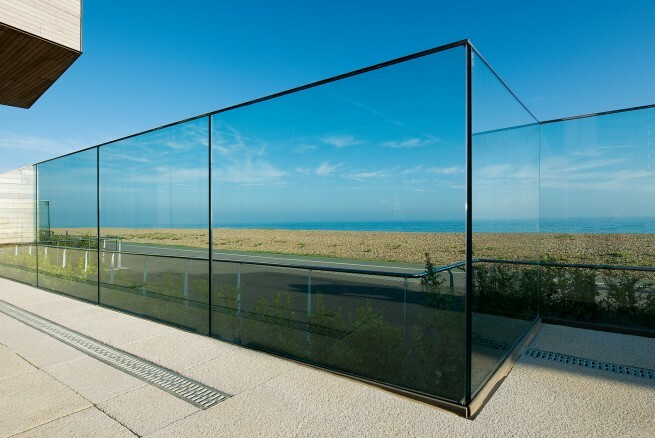 An innovative dry fixing system has been developed for the B40 structural glass balustrade range. The toughened, laminated structural glass, which is 15mm to 21.5mm thick, is wedged and clamped into the sturdy aluminium base channel. This is then concealed by cover trims, soffits or a floor finish. The advantage of this system over the more traditional wet grout or adhesive systems is that glass can be quickly and efficiently installed without the risk of leakage and resultant staining of surrounding surfaces. Should breakages occur, broken panels can be easily replaced. The system consists of a series of polycarbonate wedges which fit together and are driven into place, providing a highly secure fixing for most B40 structural glass systems.